Amsterdam’s IJ-Hallen—it’s where the savvy Dutch go to find inexpensive Amsterdam Hip, Shabby Chic, Boho, Mid-Century Modern, still-serviceable clothes, and just plain used stuff. It’s a genuine flea market, the largest in Europe, and here’s why you really need to go. I’m a bargain junkie. Always have been; probably always will be. 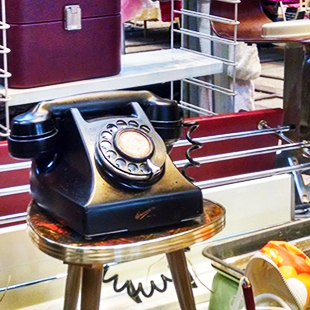 Flea markets, swap meets, rummage sales…I’m in my element. Garage sales? Let me at ’em. I’m even pretty good at dumpster diving. With the goodies I’ve discovered, I’ve furnished homes and clothed bodies, and sometimes made a living. I’ve run stalls in antique markets, sold vintage goods on eBay. So picture me in heaven walking around the largest genuine flea market in Europe. IJ-Hallen, the Amsterdam Vlooienmarkt, is housed in a couple of monster industrial buildings on Amsterdam’s hip north side. For one weekend every 3-4 weeks, the treasure hunt is on and those huge, high-ceiling buildings buzz with goods and greats, intense bargaining, food and fun. And they are a great way to see the Dutch in their own element. Hippie and hipster alike come to IJ-Hallen, along with young moms on a budget, eclectic collectors, college students, and dealers with shopping carts looking for great merchandise for their more upscale stores. You’ll get a wonderful overview of Dutch society. 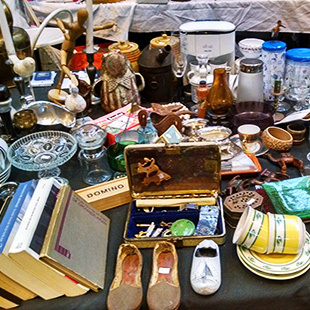 These people are like me–flea markets make them happy. 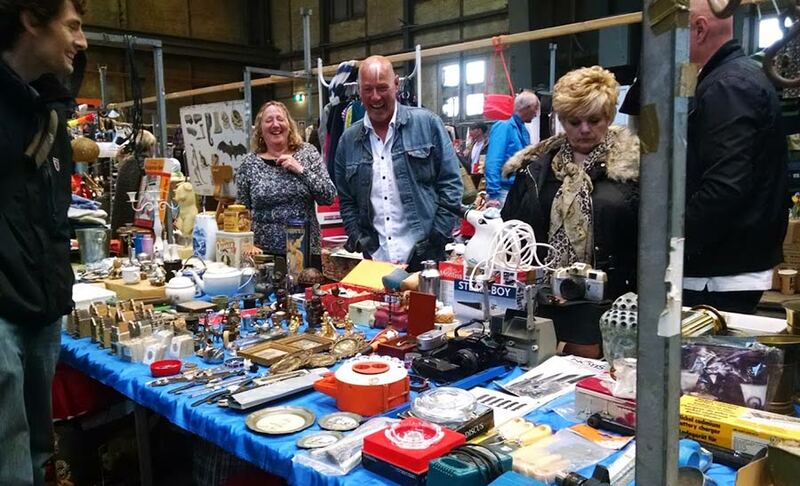 And the Amsterdam IJ-Hallen flea market is Europe’s largest and one of its best. The buildings themselves are part of the show. They used to be giant ship-building and repair structures for the NDSM (Nederlandse Droogdok en Scheepsbouw Maatschappij—Netherlands Drydock and Shipbuilding Company). Ships were built and outfitted here for more than a hundred years until the company went bankrupt in 1984. After the buildings were abandoned, they became perfect fodder for the long Amsterdam tradition of “squatting” by artists and other creative and free-thinking types. And where artists go, so goes the crowd, and the fun. The whole neighborhood of Noord (North) has become a creative destination, mostly playing off the old industrial look. You can find galleries and artists’ lofts, buildings made of shipping containers, graffiti walls, performance venues and good food and drink. 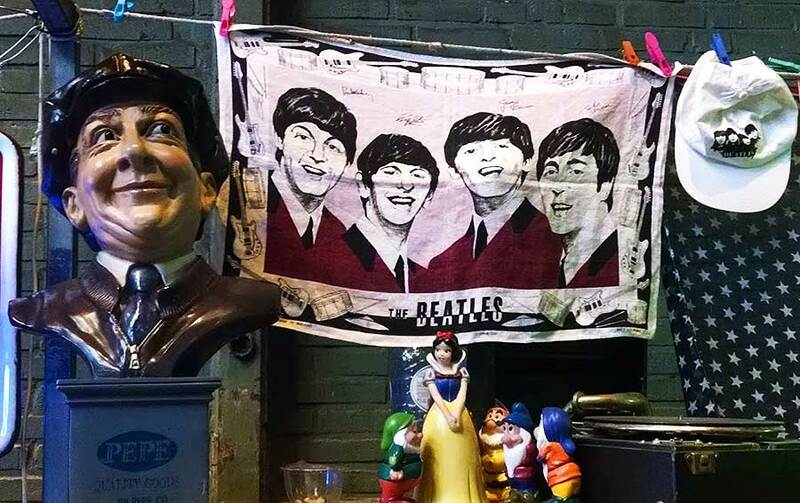 A flea market made the perfect shopping experience for such a neighborhood. 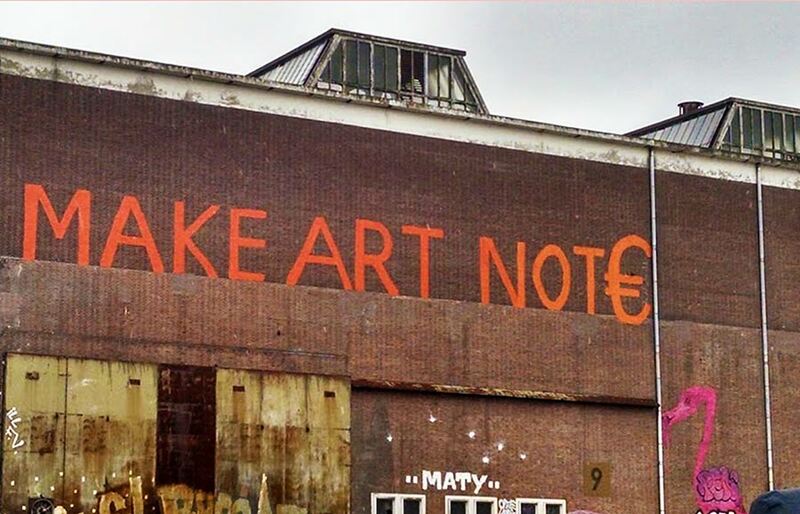 The attitude is visible on the very walls of the IJ-Hallen warehouse—Make Art, Not €. Make Art, Not € [Euros]. Watch where you step. These old industrial floors can catch you unaware. These buildings were designed for ships, big ones, and everything that went with them. This hard and heavy industrial past is clear in the buildings’ bones. The ceiling stretches up to forever, with high windows to let in the light. The visible structural bones are raw and gritty. 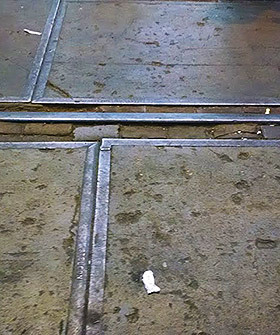 The floors are criss-crossed with iron rails and bumps in the concrete, making it important to watch your step carefully. Since heating such an enormous space would be impossible, be sure to wear something warm if you are hitting it on one of the winter markets. There is an entrance fee of 5€, or 2€ for children. Consider it the price of a half-day’s entertainment. When you pay the fee, you’re given a yellow plastic poker-chip-sized token, so you can leave and re-enter. You’ll find toilets near the entrance, for which you will be asked to pay a small fee. There’s a pretty short list of what you can’t find at IJ-Hallen, though it’s heavy on used clothing and light on furniture and true antiques. With 500 inside stalls, and another 250 or so outside when the weather allows, you’re bound to find something you need and can stuff into your suitcase. I saw several tables dealing is vinyl records, lots of kitchen gadgetry, glassware, ceramics. There were tchotchkes galore, from wall hangings to tennis rackets made into mirrors, to vintage marbles, to beer steins, to Delft tiles to combat boots, to tools, to… well, you get the idea. It’s nothing if not eclectic, with random trash and treasures in every corner. No new or wholesaled merchandise is allowed at the IJ-Hallen flea market, which makes the hunt all the richer. 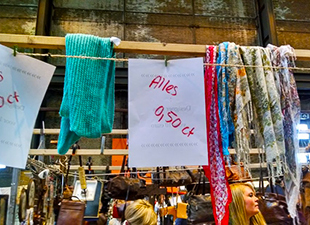 The IJ-Hallen flea market is heavy on used clothes. I saw tables of items for 5€ each. Like with any true flea market, you need to arrive early for the best items and stay late for the best prices. I was there in the afternoon, and just before closing many things were practically being given away. I bought two pretty scarves for one Euro total, and the owner threw in a third for free. Bargaining is allowed and expected. And do bring cash. Most sellers are not set up to take credit cards. The mix of merchandise at IJ-Hallen is nothing if not eclectic! And a lot of fun. I hate it when things I have used for more than half my life are now “vintage”–or worse still, antiques. 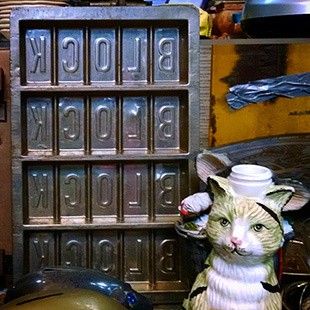 A mold for making chocolate bars and a ceramic cat seem to enjoy each others’ company. 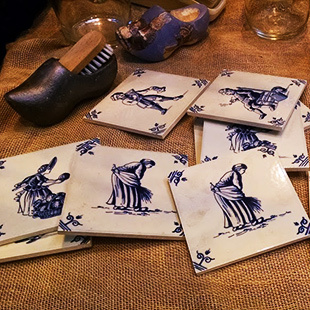 Classic blue-and-white Delft tiles sit beside iconic wooden shoes. What could be more Dutch? 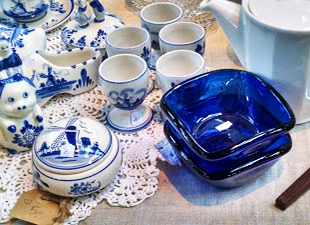 Blue-and-white Delft ware goes well with cobalt glass. I would buy those bowls! 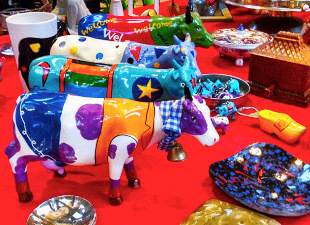 Bright ceramic cows line up for inspection beside enamel plates and a wooden shoe bottle opener. Towards the end of the day, merchants drop prices drastically! I got 3 of these scarves for 1€. 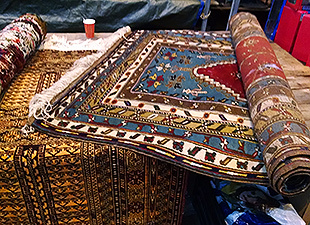 These Asian carpets are popular in Amsterdam, due to the country’s long occupation of Indonesia. All those hours of wandering the aisles, wondering if you can get such treasures home, and trying on used shirts over your clothes can work up an appetite. Not a problem. There are food stands for snacks and hot drinks. Try a Dutch specialty like saucijzenbroodjes (sausage rolls), frites (French fries), or my very favorite, poffertjes, which are small, pillowy pancakes smothered in melted butter and powdered sugar. It’s not hard to get to IJ-Hallen and Amsterdam Noord. And it’s fun because you have to cross the water. The efficient Dutch have taken care of that with free ferries that cross the IJ regularly. Go to Central Station and walk all the way straight through the station and out the rear to the north side. You’ll be facing the River IJ, where the free ferries dock. The one you want is to the left as you emerge from the station. Look for ferry #906 going to “NDSM-werf.” It is not at all hard to find. The free ferries run every 30 minutes on weekends and the crossing takes about 15 minutes. On the way, you’ll get a wonderful view of the futuristic building of the Eye Film Institute and Museum. 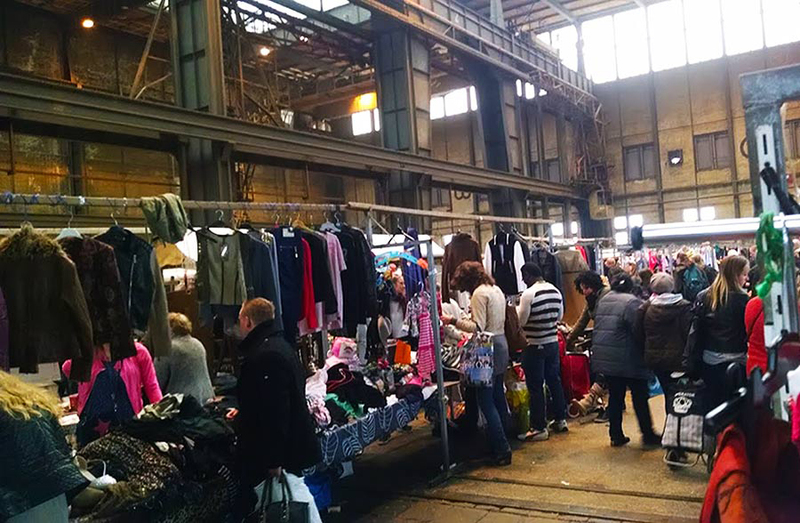 The IJ-Hallen flea market is a 5-minute walk from the ferry landing. Just follow the crowds. The flea market used to be held on the first weekend of every month, but that seems to have changed to a more erratic schedule. It’s important to check their calendar to be sure of the dates. You can find it in English at http://ijhallen.nl/en/ It is open on specified Saturdays and Sundays from 9 am to 4:30 pm. I have never been interested in traveling outside the United States. Your post is enticing. So much that I am putting Amsterdam, and this wonderful shopping excursion on my “want” list. That is lovely to hear, Nita. I would encourage you to think even more about traveling outside the US. It is a big wonderful world out there and the more we see of it, the more we understand it and our own place in it. I think traveling is the best possible education. And besides that, it is just fun! I hope you do get to Amsterdam. I think you will love. I’ve been to Amsterdam several times but was not aware of IJ-Hallen. Hope it’s running next time I’m in town. The people watching would be as much fun as the “finds”. Nailed it, Janet. I didn’t buy anything beyond those scarves I mentioned, but the “window-shopping” and the people-watching were the highlight of the day. I hope it’s on when you go. It is definitely worth checking out, Carmen, if you are ever in Amsterdam at the right itme. Happens once a month. Oh I love a good flea market! Me too, Ruth. I can just wander for hours. Wow! That flea market looks pretty nice! I´d like to go there and get some clothes for myself and my daughter. I´ve never been there but it looks pretty welcoming. Welcoming is a good word for it. It’s very casual and friendly, and you never know what you’ll find.